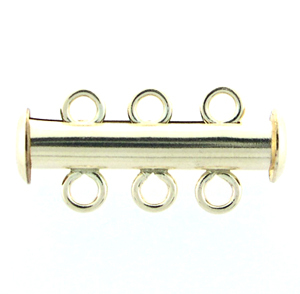 Beautiful Gold-Filled Triple Strand Slider clasps - magnetic!!. There's a small magnet inside one half, that makes these even simpler to close for the digitally challenged! Very simple.. just line up the two sides.. and it slides shut by itself - no hassle, yet secure! Measures approximately 21mm closed.